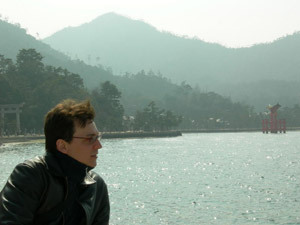 "Japan: A journey to Here and Now"
I spent eight years in Japan. Looking back, I realize that I could haveeasily stayed for even much longer.After finishing the Physics Dept. in Thessaloniki, my wish to studyabroad was strong. A friend of mine that spent a year at the Hiroshima University gave me a glimpse of Japan. After some necessary search, I decided to apply for the MEXT scholarship, and more specifically to study Electrical Engineering at the Tokyo Institute of Technology(TokyoTech). 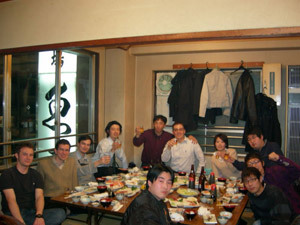 I firstly arrived in Japan in April of 1996 as a MEXT scholarship student. I only had an elementary knowledge of Japanese, a vague image of Japan through Akira Kurosawa's movies, some TV images of bullet trains, and a few of the usual stereotypes about excessive working hours.I spent a year as a Research student, entered the Master Course in 1999,and obtained the PhD degree in Signal Processing by the end of March 2002. All in the Sakaniwa-Yamada Lab of TokyoTech, through the support of MEXT. For the first six months I attended the intensive Japanese language course of the TokyoTech appointed by the Japanese Government, which proved to be very helpful for my communication with my lab mates, and for the everyday life. I forced myself to speak only in Japanese, making the transition step to the Japanese way of thinking as short as possible. By the end of my second year in Japan, I managed to pass the 2nd level of the Japanese Language Proficiency Test. The MEXT scholarship allowance was sufficient. For the first year I stayed in the TokyoTech dormitory close to Yokohama, giving me thus the chance to gather money for the next year where I had to rent an apartment. I found a cheap one close to TokyoTech, and shared it with my roommate for the next five years. Not even a single problem came up during my whole stay in Japan, in terms of the scholarship allowance, the health insurance, and my studies. I came back to Greece in 2002. 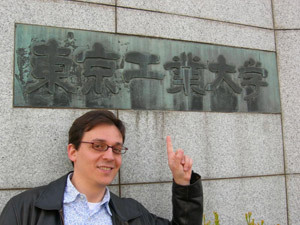 After working in the Greek telecommunications industry for two years, I moved back to TokyoTech and to the same lab for a PostDoc position and for the period from 2004 to 2006 via the support of the Japan Society for the Promotion of Science (JSPS). Nowadays, I am a PostDoc Fellow doing research in the Dept. of Informatics and Telecommunications, University of Athens. My impressions during my second stay in Japan were the same as during my first arrival in 1996. Even without the stereotypes I had at the back of my mind during my first visit, Japan kept astonishing me. The country is balancing with great success on the thin line between technological evolution and tradition. It took Japan a lot of time and effort to reach this point. This deep contrast can be experienced if someone visits the beautiful fishing villages by the Japan Sea, after spending a couple of days downtown futuristic Tokyo. The most remarkable thing is that this act of balancing is done with an apparent calmness. The Japanese have often straggled in their long history, and came to understand to face difficulties with a smile. Small steps and everyday effort are more exciting than big leaps. 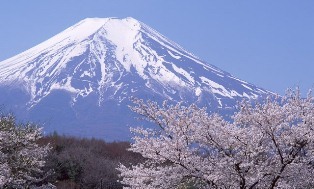 Japan has been facing challenges joyfully. If you ask a busy Japanese whether his hands are full, he will answer back 'Okagesama desu! ',meaning 'Thank God for it!'. Despite having few natural resources and being demolished after the Second World War, Japan has risen to the second largest economical power, produces high technology and even tames earthquakes. And all of these with a deep respect to Nature, especially the human one. Japan lives in the Present. Tradition becomes just a tool for facing new challenges. The Japanese people know that if they calmly observe what is happening now, a continuous effort can lead them to miracles. I strongly believe that this was the most important thing offered to me by MEXT; being born in Greece, the land of Then and There, I had the chance to live in Japan, the land of Here and Now. I would like to deeply thank the Japanese People for their hospitality and generosity. I will be counting down the days till my next visit to Japan, and especially till the time I stand again in the middle of Aoyama in Tokyo,or taste the fish, some cold Niigata Sake and a hot bath somewhere in Tohoku.